Love the completed look, but building this piece was a pain. Some of the predrilled holes weren't aligned correctly and I had to adjust the drawers several times so they would close properly. Inspired by the farmhouse look, this transitional design fits a variety of décor. The overcoat replicates a slightly weathered look into deep grained wood veneer. This piece is made of mahogany with albizia wood veneers under a six-step finishing process. 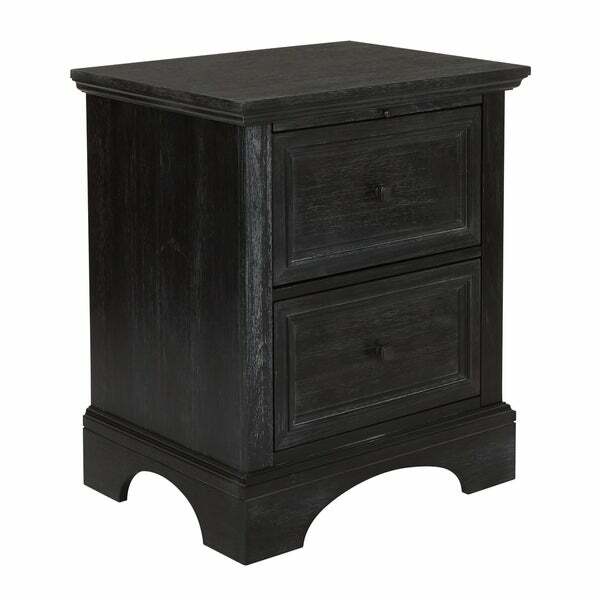 The two-drawer nightstand provides additional deep storage compartments for items. The convenient pull out beverage tray is covered in a high pressure laminate that eliminates the need for a coaster. Both storage drawers open easily on heavy duty metal glides. Dimensions 18.5 In. X 23.63 In. X 28.19 In.